First up latinoware was very well attended (you can see a slice of a group shot below). While I have attended a couple of Open Source Developer conferences as a LISAsoft employee in Australia, they tend to just walk the software side of the street. Latinoware had a great mix of hardware and software hackers. I got to see a 3D printer, with the cost brought down to around $300 to the level where it can be successful in emerging economies. I understand it was using recycled soda bottles for material. 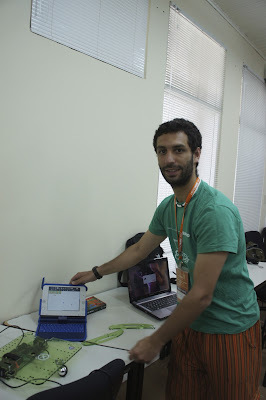 Another impressive showing was a one laptop per child kitted out with a robot accessory so it could walk around. Literally "logo to go" for the educational system - combing ing the joy of learning program with the ability to stomp around. Most of the presentations were packed, and were not afraid to take on deep or scary topics (ie how to build your own bootloader thanks to the google chromebook team). Here is a group with TCP stack frames on screen. 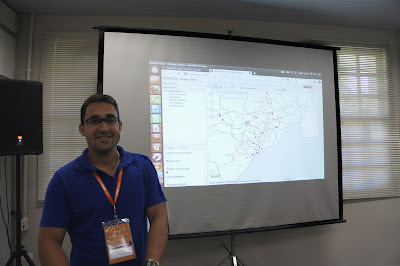 The workshops at Latinoware 2012 were different from what I expect at a FOSS4G event. We have been scared off running workshops concurrent with the regular program at FOSS4G (as attendees would often ditch presentations for the hands on experience). For Latinoware I understand demographics lean toward a student turn out, leaving the pay-to-play workshops with sparse attendance. 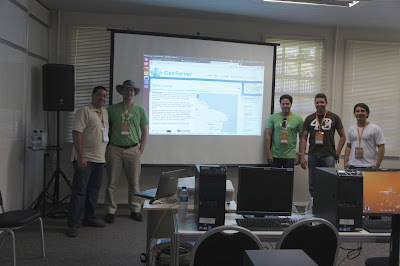 I managed to sneak into the GeoServer workshop and take a couple pictures, the workshop was being run by Benicio Ribeiro and Rafael Soto. 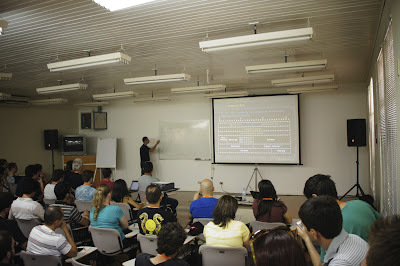 There was also a Quantum GIS workshop hosted by Luis Lopes. If you peak in the background you can see qgiscloud.com on screen as the workshop gets underway. It was great to see OSGeo projects represented on the ground at such a varied event.